In a showroom for the local goat cheese, Leif Inge Underdal boldly breaks into a verse of “Kråkevisa” – the crow’s song – stomping the beats determinedly with his foot. “I get people to sing along on that last phrase. Everyone can follow it, whether they come from Korea or anywhere else”, he says.
. And yes: his name is a variation of the name of the village. The sudden sing-along is an icebreaker as effective as the ships keeping the narrow seaways open through winter. Yet the choice of “Kråkevisa” is not random. The moral of this traditional folk tune is that one should utilize everything and not throw anything away – a lesson that has been important here in this isolated valley throughout history. “I try to give an understanding of how it is possible to live off the land along the fjord. Every resource associated with the farm has to be leveraged to sustain the agriculture”, explains Underdal, who also runs the village’s local grocery store. Selling local cheese in Undredal. Erna's popular cheeses are made from fresh goat milk. A cruise on the Nærøyfjord. A couple of minutes up the still-new road from Undredal there’s a cluster of small farms producing goat cheese and meats. At midday, one of them has a post-it note nailed to the front door: “The milkmaid is on break till 2 PM”. Rubbing sleep out of her eyes, Erna Underdal Skarsbø still offers coffee and cake with freshly made goat cheese. That’s what you do in these parts when a stranger comes knocking. The cheese isn’t usually made in the next room, though. “It was made this morning”, says Erna, who’s up at four in the morning every day to milk the animals. Some of her cheese she sells at Leif Inge’s store in Undredal. But now that there’s a road, she’s had visitors coming by car from the Netherlands, Germany, Russia and Eastern Europe, seeing her “Goat cheese for sale” sign from the road. “We’ll communicate using finger language and some words in broken English”, tells Erna, whose farm has been in the family for four generations. One of Norway’s most characteristic products is the brown whey cheese made from goat’s milk. 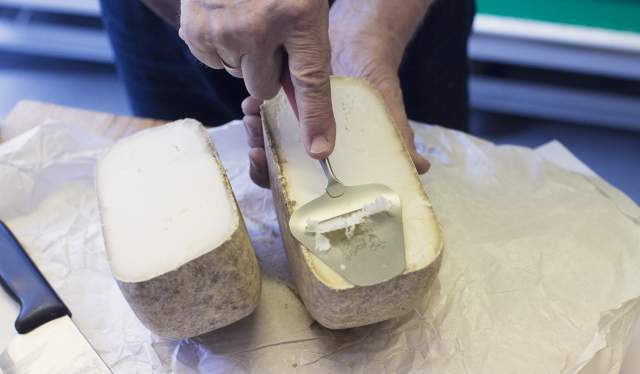 “The whey is boiled for 7–8 hours until the milk’s natural sugars get caramelized”, explains Underdal at the café, while showcasing four different kinds of cheese from the valley’s small factory. Everything is locally produced, everything is full of flavour: “The goats are free to climb up the mountainside to find the very best food. And when they eat the best, then you will also get the best milk possible”, says the grocer. Everything is locally produced, everything is full of flavor: “The goats are free to climb up the mountainside to find the very best food. And when they eat the best, then you will also get the best milk possible”, says the grocer. It is from the fjord that you’ll get the best view of the traditional mountainside farms, clinging, impossibly, to the steep slopes. The famous “Stigen” – the ladder – is a good example: a solitary farm several hundred meters removed from the turquoise fjord water below. “When the tax collector came to collect money back in the old days, they’d pull up the ladder so he couldn’t get there. 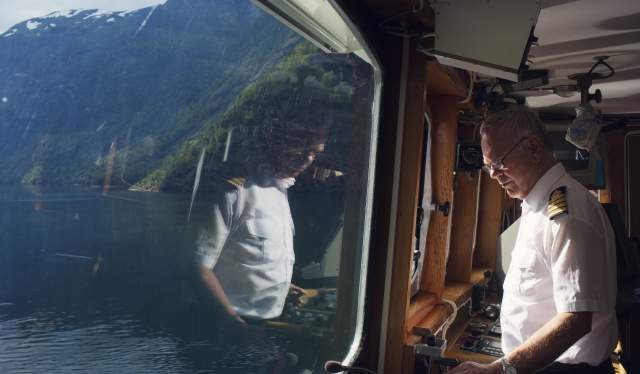 Or so the story goes”, says Per A. Hove, captain of MF Fanaraaken running the route between Flåm and Gudvangen. On the shore, you can also see Undredal stave church, built in 1147 and the smallest in Scandinavia in regular use. The church is open daily during the summer season and is well worth a visit. Along the Nærøyfjord you can still get a glimpse of three old hamlets squeezed in between the fjords and the mountains, where people have lived and made a living since time immemorial. The largest of them had perhaps 40 residents only a few generations ago, but now there are hardly any left at all. “Just one single guy stays in that hamlet over the winter”, says Hove, pointing at one charming, tiny settlement as the ferry glides silently past.